Astoria Palace Copacabana Hotel, Rio de Janeiro, Brazil details from BrazilBookers.com. The Astoria Palace in Rio de Janeiro in Brazil is located on the famous Copacabana beach. 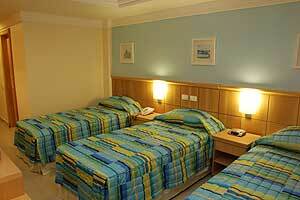 The hotel has a total of 116 rooms which are designed keeping in mind the comfort of its guests. All the rooms are well equipped with an air conditioning system, electric locks, personal safes, mini-bar, cable TV and telephones. Along with its proximity to the beach, this hotel in Rio de Janeiro also boasts of a leisure area that has a swimming pool, hydromassage, steam room and a fitness room which cater to the needs of the guests. Astoria Palace also houses an American style bar, a business centre and a daily breakfast service. 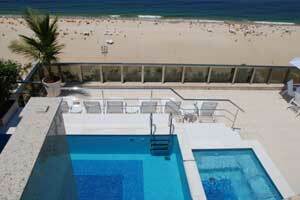 Located on Rio de Janeiro’s famous Copacabana beach, Hotel Astoria Palace is a landmark hotel in modern amenities. At a 40-minute distance from the International Airport at Tom Jobim and 10 minutes away from the Domestic Airport at Santos Dumont, Hotel Astoria Palace is situated right in the middle of the busy and exciting life that is characteristic to this famous city in Brazil. In addition to this, the hotel is a very short distance away from the Ipanema beach and downtown Rio about 8 kilometers away from the city’s center. A subway terminal right across the road from the hotel is strategic in the making easy transport available for the guests who choose to stay here. The Sambadrome, Sugarloaf Mountain and Corcovado are within a 15 minute radius of this hotel. Astoria Palace’s favorable location places shopping malls, theatres and an active nightlife easily within the reach of the tourists. The 116 rooms in this hotel are provided with modern services for its guests. The rooms, divided into Standard rooms, Luxury rooms, Super Luxury rooms and Palace Suites, are air-conditioned and come with cable TV, WiFi and high speed internet access and an electronic safe. The Palace Suites are a benchmark in luxury and have a whirlpool and a sauna in them. Most of the rooms at the hotel have the added advantage of opening up to a beautiful view of the ocean. The hotel also offers various packages for the New Year’s and Carnival celebrations that take place in Rio de Janeiro annually. The restaurant at the Astoria Palace offers both a buffet service with a variety of food items and an a la carte menu specializing in the local cuisine. The hotel’s has a swimming pool on the rooftop with a pool bar to go with it, providing the perfect ambience to laze around in the water or sunbathe on one of the lounge chairs while admiring the expansive, postcard perfect view of the beach and the ocean. The hotel’s gymnasium might not be big in size but compensates for it by being well equipped with the most modern fitness instruments that are available. The hotel also houses a sauna and a massage room for its guests. The TV room also forms an important component of the recreational facilities that Hotel Astoria Palace has to offer. Probably the most popular city in the country, Rio de Janeiro is synonymous with active, sandy beaches and an exciting urban life. Hotel Astoria Palace offers its guests exactly that. 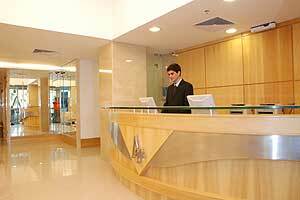 When would you like to stay at Astoria Palace Copacabana Hotel ? 1) Rates at the Astoria Palace Copacabana Hotel may not be valid during Carnival, New Years, Easter and other special dates. © Copyright Bookers International, LLC. All Rights Reserved – Information on Astoria Palace Copacabana Hotel, Rio de Janeiro, Brazil details from BrazilBookers.com.